Trusted on mountains and trails for over 15 years, SteriPEN Classic is the best-selling portable UV purifier of all time. Since 1999, hundreds of thousands of people have ensured their drinking water is safe and avoided ruined adventures with SteriPEN Classic. The next generation of Classic operates with alkaline batteries! With one set of alkaline batteries, Classic 3 purifies up to 50 liters or use lithium batteries an you'll treat up to 150 liters! With a lamp life of up to 8,000 liters, you'll be drinking safe water for over 7 years! 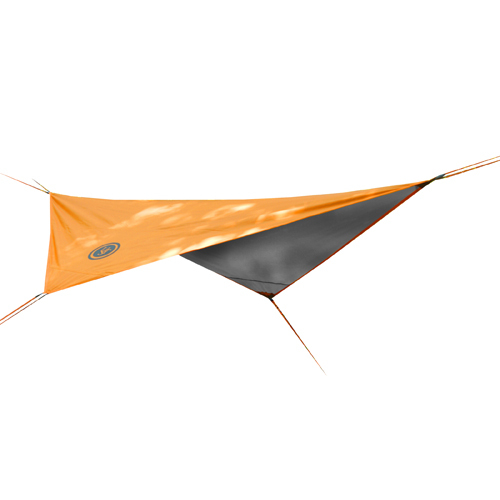 When camping, hiking, backpacking or traveling the Classic 3 with Pre-Filter is the perfect pack to keep you safely hydrated. 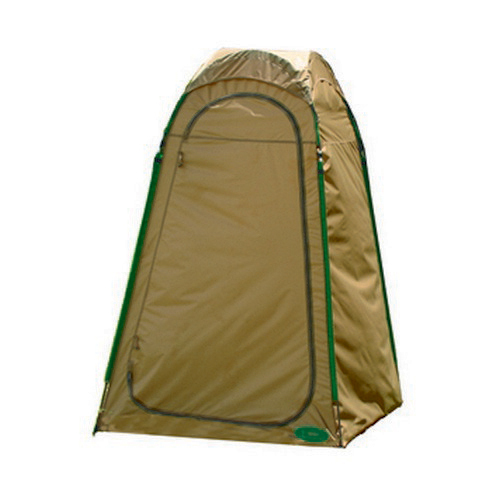 Classic 3's UV light destroys over 99.9% of waterborne microorganisms that cause illness. With SteriPEN Classic 3, one set of four alkaline batteries will treat 100 half-liters or 50 full liters of water. Or supercharge your SteriPEN with a set of lithium batteries and you'll treat up to 150 liters! Classic 3's enhanced LED indicator panel lets you know treatment size and status of batteries and UV lamp. Classic 3 is sleek and ergonomic with an easy-to-remove twist-off lamp cover. Like all SteriPEN UV water purifiers, Classic 3 is simple to use: remove the lamp cover, press the activation button, submerge in water and stir. In 48 seconds you have liter of safe drinking water or purify a full liter in 90 seconds. Compared to standard chemical treatments that can take up to four hours, that's safe water fast without adding chemicals that can leave an unpleasant aftertaste. The 4040 micron screen Pre-Filter fits perfectly on wide-mouth one liter water bottles and removes particulates that can get in the way of UV light in water. 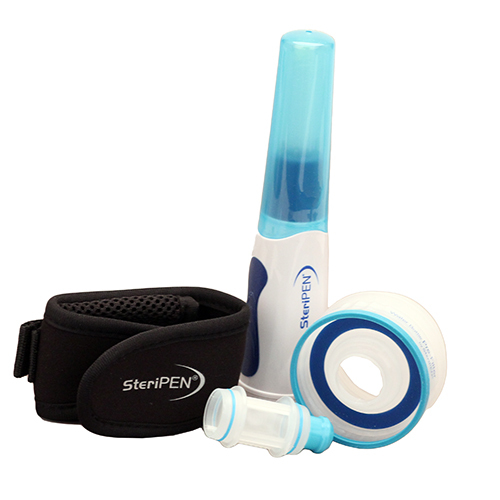 The Pre-Filter is designed to be stored directly on a wide mouth bottle and the SteriPEN Classic 3 fits perfectly in the filter. Just insert Classic 3 in the filter opening, turn the bottle upside down, and gently rock to circulate light throughout bottle. The tapered end also fits snugly in plastic water bottles. Just insert the lamp into the water bottle, turn it upside down and gently rock the bottle. - Ergonomic design with a new easy-to-remove twist-off cap. 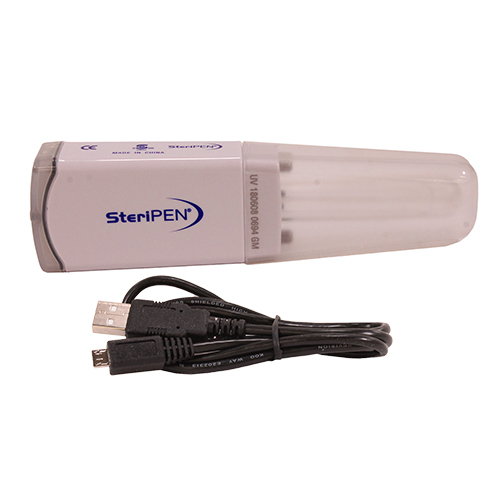 - The first SteriPEN to be work effectively with alkaline batteries. Can be powered by alkaline, lithium, or NiMH batteries. - Enhanced LEDs indicate treatment size and status of batteries and lamp. - Watertight. No more worries about dropping your Classic 3 in a bottle or stream. - So easy just activate, place in water, and stir. LED indicators flash to let you know when water is safe to drink. - Battery Life: Alkaline: 100 treatments (16oz.) or 50 treatments (32oz. ), Lithium Disposable: 200 treatments (16oz.) or 100 treatments (32oz. ), NiMH: 200 treatments (16oz.) or 100 treatments (32oz.). - Minimum Bottle Diameter: 0.8"
- Dimensions: 7.3" x 1.7" x 1.7"